Room amenities are nearly too many to list, but they do include "Smart" room technology with sophisticated electronic body temperature adjustment; direct-dial telephones (only two line), with data port connection; work area with desk; bathrooms with Jacuzzi or steam shower; electric current 220V - 50 cycles (adaptors available); shaver outlets 110/220V; satellite TV; in-room safe with electronic security lock system; electric overhead fan; mini bar; hairdryer, and the latest in life safety systems, such as sprinklers, smoke detectors, fire alarms, and voice communication network throughout the hotel. Guest services include Helipad & Helicopter Service, Express check-in and check-out, welcome drink (fresh seasonal fruit or traditional refreshment), VIP welcome desk, fresh fruit daily, a full range of bathroom amenities, access for the disabled, first-aid clinic, shuttle bus to and from town, overnight laundry/valet, a full shopping arcade including a pharmacy, jewelry shop, gift shop and fashion boutique. Additionally, the St. John provides a private sandy beach facing the island of Delos, a Chapel with Cycladic architecture on the hotel premises, three restaurants and three bars, pool terrace and garden, Internet room, traditional coffee shop, club lounge with private reception area, tennis court, miniature soccer (five-on-five), the largest hotel swimming pool on the island of Mykonos, children’s pool, an extensive Health Club and Spa including sauna, solarium, indoor heated pool, aromatherapy, massage therapists and mud baths. There is a full service beauty center, which includes hair stylists, facials, manicure and pedicure; and a Fitness center including a fully equipped gym. The Business Center has PC work stations and secretarial facilities. Convention and banqueting facilities include four conference and meeting areas for up to 800 persons (offering state-of-the-art technical facilities and a highly trained staff). Over 2,000 square meters of outdoor convention and function space aligns the impressive pool area, near a cliff with 600 square meters of water surface. Gala Dinners and Events can be catered for more than 1,500 persons. The St. John’s three restaurants, all strategically located to take advantage of the breathtaking views, take dining on Mykonos to new levels of enjoyment. Whether enjoying a sumptuous buffet breakfast on the pool deck, or dining at the gourmet restaurant ‘7th Heaven,’ you will find nothing but the freshest ingredients, innovative cuisine, and impeccable service. The Saint John is situated at Ai. 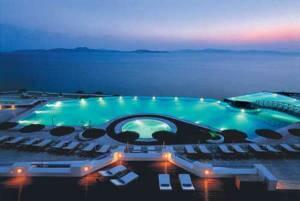 Ioannis, four kilometers from Mykonos Town, and just opposite the Sacred Island of Delos.